I must be doing something right in life, because once again, I got invited back to help at a booth at the Houston International Fall Quilt Market. This next week is the International Quilt Festival, also in Houston, which is open to the public. Last night I was invited to attend the Sample Spree Sale, which is a pre-market sale. If you've ever gone, you'll know how crazy it is. Store owners begin lining up at the doors hours before it starts to get the best pickings. Have you ever wondered how the quilting stores have quilts to showcase a particular line of fabric that has just come out? It's because they've purchased the fabric at a pre-market sale. This was the bag that Moda gave out to hold all your purchases in. Soooooo darling and useful! These baskets were being sold next to the booth where I'm helping. Fig Tree's new line coming out, Mirabelle. Zen Chick's new line called "Sphere", it's designed and very similar to "Architextures" by Carolyn Friedlander. In the middle is Sweetwater's new line, "Wishes". 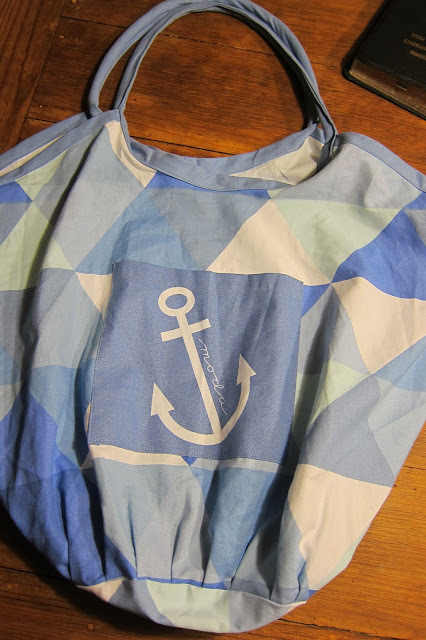 This post on their blog showcases this new darling line coming out soon. Today I get to go help at market. I'll share some pictures with you. It's just amazing to me all the different aspects of the quilting industry. There's the ladies who have ideas rolling around in their heads of pattern designs, fabric designs, quilting designs . . . there are all the angles coming from the manufacture's side, the marketing, the sales promotions of the newest gadgets and rulers. The list goes on and on . . . so much talent! Willow Leaf Studio is the booth I'm helping with. They sell Pantograph designs for long-armer quilters. This website has lots of fun designs you can purchase from. 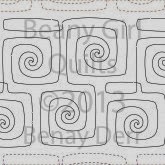 This one's called Geometric Swirls by Beany Girl quilts, with designer Benay Derr, leading pantograph designer. Another favorite design of hers is called "Drip". Pictures of Market to follow soon! I'd love to share this 3.5 Stacker of 22 fabrics. 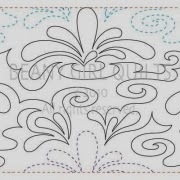 Share with me which of Beany Girl Quilt's pantograph designs is your favorite. I love the Christmas Peace design - this would look fab on a Christmas table runner!! Gee I wish I could fly over to the US for market! I am thinking I would use the pretty paisley the most, but I also like grove. There is a lot of talent there! Wow. Market sounds like some crazy fun! So many fun designs to choose from, the one that really caught my eye is Novaya Zhizn. I am always looking for new pantos. Thanks for sharing this! I think my favorite of hers is the Swirly Feathers. However, I like the Geometric Swirls also since it is more masculine and it is hard to find good masculine designs. Thanks for the giveaway opportunity! I have an older machine and need four inch wide pantos. I liked Plain Daisy. I love Fluffy Clouds... But there are a bunch of others that are really nice too! Geometric swirls is my favourite! Thanks, I'd love to get my hands on some new fabric. I like the geometric swirls! It must be so exciting to be a part of market! I love the goldfish design! Wow, it sounds like you are having a great time! I think Funky Music is my favorite.